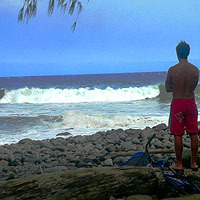 Kolekole Beach County Park is located about 13 miles outside of Hilo on the Hāmākua Coast on Highway 19. This beautiful small park is popular with the locals on weekends and offers a wide grassy area, pavilions, picnic tables, bathrooms and more. One of a series of under-the-bridge parks the output of the famous 'Akaka Falls runs as a wide stream through this park and a photogenic small waterfall is near the front of the stream by the ocean. 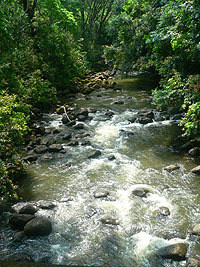 The Kolekole Beach County Park is in the district of South Hilo. 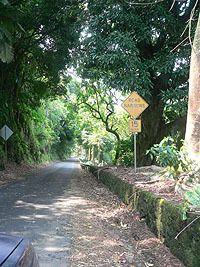 To get to the park take Highway 19, north, out of Hilo about 13 miles. Just past the turnoff for 'Akaka Falls is a bridge spanning a valley. Just before the bridge, on the left, is the sign for the park. The park has restrooms, picnic tables and shelters. There is drinking water at the park. 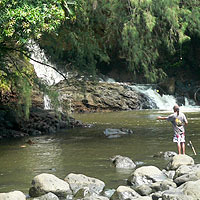 Locals swim and fish in the stream though you should be warned that all Hawai'i streams have Leptospirosis and Giardia in them so do not attempt swimming if you have any open cuts or scratches. Do not swim near the mouth of the river or in the ocean. The current is strong and the bottom is very rocky. While locals do surf here DO NOT, as a visitor, try to enter the ocean at this park. 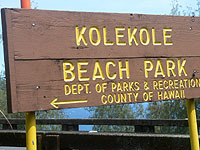 Kolekole Beach County Park is at sea level. 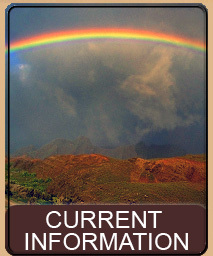 Because it is on the Hāmākua Coast the weather ranges from beautifully sunny to rainy and breezy. 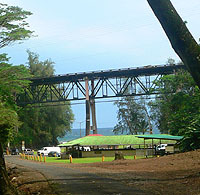 The huge 100 foot high bridges that span the deep valleys along the Hāmākua Coast were originally a railroad built by the Hawai'i Consolidated Railway Company to haul goods between Hilo and Hāmākua. 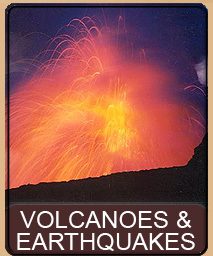 However, the tsunami of 1946 caused major damage to some of the bridges and forced the closure of the railroad line. By 1949 the bridges had been repaired and were resurfaced to be used by cars. Recently, from 2000 to 2005 another renovation of all the bridges occurred to bring them up to modern earthquake proof standards. 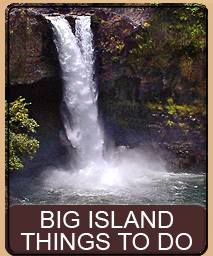 As you drive the Hāmākua Coast many of these bridges span over waterfalls and other beautiful scenery. Our rule is the look left look right quick glance, while driving over the bridge and trying not to get hit by oncoming traffic. 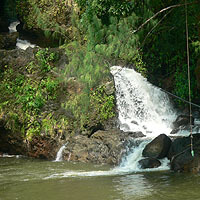 The look left is often of stunning waterfalls and the look right is often of stunning ocean vistas. Several of these bridges have parks way below them. The entrance to the park is almost always (but not always) mauka (towards the mountains) either just before or just after the bridge. 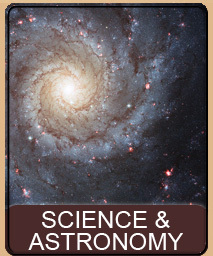 Quite often the signs are masked and hard to see, or are just after or on a curve, so be careful! 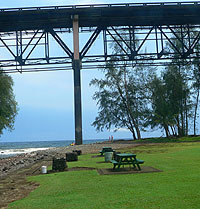 Kolekole Beach County Park is just one such park and is the first under-the-bridge park you come to after leaving Hilo. As you turn off of the highway you enter a narrow road with cliff lining the left side and a drop off to the valley floor on the right side. Lush vegetation overhead filters out the sunlight leaving a muted atmosphere. 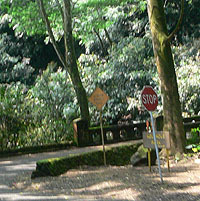 The left side, along the road, is dotted with colorful Impatiens in full bloom and a variety of trees make up the forest that surrounds you. As you descend and near the base of the road it divides with a right into the park while the road itself continues over a bridge built in 1929 and on. 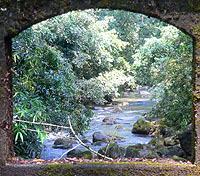 The bridge goes over Kolekole Stream which is fed from the famous 'Akaka Falls, 4 miles away. Kolekole Stream continues through the park, where another small waterfall joins it, and out through a tiny bay and into the ocean. Take a right into the park and you will be driving along the stream. After a short distance you enter the park where there is ample parking. There are a number of pavilions in the park, each with tables and some with cooking areas. Bathrooms are available as is an outdoor shower for those who have gone swimming. 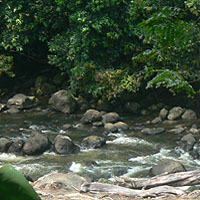 The stream which lines the park offers many shady places to sit and relax and both fishing and swimming are popular in the stream. Do be warned though that some of the trees lining the stream are coconut and you should always be on the lookout for falling coconuts. While locals do surf in the ocean here we do not recommend approaching the mouth of the river nor going into the ocean at this spot as it is very rough with strong currents and very rocky. Also be warned, as we already mentioned above, Hawai'i streams all have Leptospirosis and Giardia in them so avoid swallowing water and do not enter the water if you have open cuts or wounds. Between the pavilions and the ocean is a large, open and sunny (on a nice day) grassy area perfect for tanning, or flying a kite or having a picnic in the sun. Near the ocean spans the impressive 100 foot tall bridge which you can walk under. Be careful walking near the stream and ocean however as the shore consists of many small rocks which tend to roll under your feet. Near the bridge, on the other side of the stream is a beautiful photogenic small waterfall. Water, coming from a split-off of the stream comes through a lava tube and out of the rock wall, down a series of stairs and then falls about 10 feet into the stream. 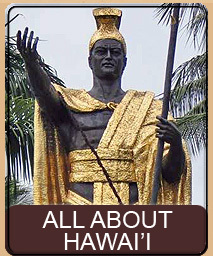 The Hawaiian word Kolekole (ko-lay-ko-lay) means talk story and probably goes along way to explaining why this park is popular with the locals on weekends. 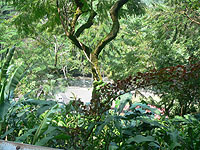 Many families come to talk story with each other while they relax, picnic, swim and fish. However, weekdays usually find the park virtually empty with only the occasional fisherman and tourists. Kolekole Beach County Park is the perfect stop for a stretch and perhaps a picnic on your way up the Hāmākua Coast. A quick diversion from the highway, this treat is both beautiful and relaxing and a jewel along the wonderful Hāmākua Coast. 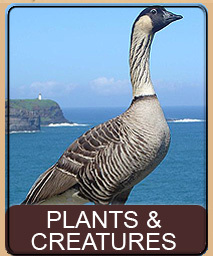 This page is named 'Parks.kole'. Can't Find It?